From St. Leonardo in Pass. (675m) in Italy this is a long and hard climb. 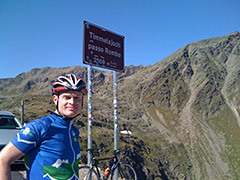 (One could start the climb even further down at Merano/Meran (317m).) Between Moos in Pass. (1007m) and Schönau/Belprato (1759m) one will find a steep section, but first after Schönau the serpentine pass road starts. They close the road at Schönau and at Obergurgl (1850m) on the other side at 8 pm each day, which is relatively early for the passes that closes at night. It is however possible to get under the turnpike with your bicycle and enjoy the pass without cars (or almost – I saw one (probably a local)). From deep down in the Ötztal you get up from Oetz (781m) via Sölden (1418m at turn off for Ötztaler Gletscherstraße) on a more evenly steep road, which is not as steep as on the south side. Note that there is a long tunnel near the top on the Italian side that is not lit, but which is not a big problem as it is straight and flat. On the Austrian side of the pass the road goes down (very fast descent here on a straight road) and then up again a little before it descends to Obergurgl.